Everyone who has ever held a job has, at some point, felt the pressure of work-related stress, even if you love what you do. 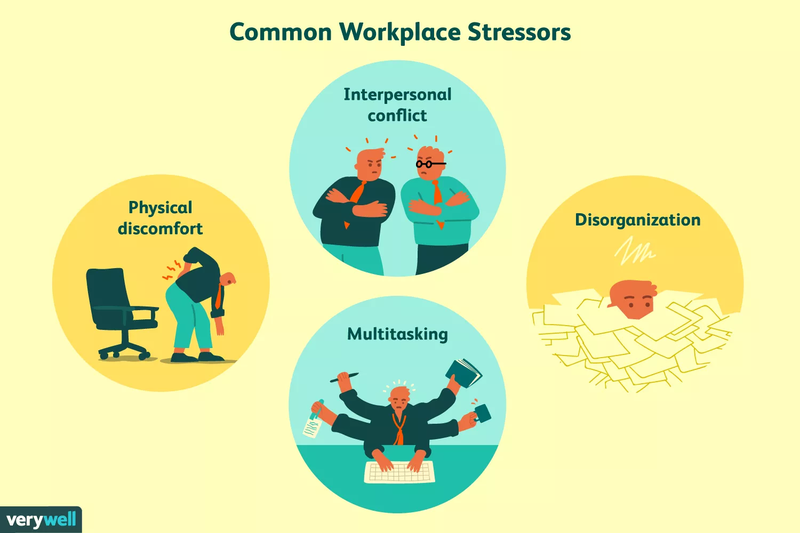 Work stress has significant health consequences that range from the relatively benign—more colds and flus—to the more serious, like heart disease and metabolic syndrome. Below you’ll find some stress management techniques to try. For many of us, mornings are the hardest part of the day. If you start off the day with good nutrition, proper planning, and a positive attitude, you may find the stress of the workplace rolling off your back more easily. Don’t live a sedentary lifestyle. Get some exercise during your lunch break and perhaps take short exercise breaks throughout the day. This can help you blow off steam, lift your mood, and get into better shape. Try to avoid those people at work who don’t work well with others, don’t gossip, don’t share too many of your personal opinions about religion and politics, and try to steer clear of colorful office humor. If conflict finds you anyway, learn how to deal with it appropriately. Even though we’re driven toward multitasking, the truth is that it lowers productivity and increases accidents. People started realizing that when they had a phone in their ear and were making calculations at the same time, their speed and accuracy suffered. Rather than multitasking, try a new strategy known as chunking. If you don’t know exactly what’s expected of you, or if the requirements keep changing with little notice, you may find yourself much more stressed than necessary. If you find yourself not knowing if what you’re doing is enough, it may help to have a talk with your supervisor and go over expectations, and strategies for meeting them. This can relieve stress for both of you! Organization is a key component of productivity. When clutter accumulates, our attention diminishes and performance can suffer as a result. When your brain, time, work space and projects are organized, it becomes easier to streamline both your actions and thoughts. Do what you can to ensure that you’re working from a quiet, comfortable and soothing work space that won’t cause physical discomfort. Even small things like office noise can be distracting and cause low-grade frustration. With competing deadlines and fast-changing priorities, it’s critical to define what’s truly important and why. Sort your to-do list by focusing on those projects that will have the most impact and are best aligned with your goals. Music isn’t just a form of entertainment, it can provide many benefits like combating the stress of a long day at work and helping you be prepared to interact with the people in your life. All content provided on this blog is for informational and educational purposes only. Opinions expressed herein and in any corresponding comments are the personal opinions of the original authors, and not the opinions of Investors Trust Assurance SPC®, its affiliates or any entity within the ITA Group. Investors Trust Assurance SPC makes no representations as to the accuracy or completeness of any information on this site or found by following any link on this site. Investors Trust Assurance SPC is not liable for any errors or omissions in this information nor for the availability of this information. The information found on this blog is to be used at the reader’s own risk; it is for educational and informational purposes only and is not to be taken as professional advice. You should always consult your physician before starting any exercise or diet program. Investors Trust Assurance SPC, its affiliates, the entities within the ITA Group and the authors of this blog are not liable for any losses, injuries, or damages from the display or use of this information. The terms and conditions of use of this blog are subject to change at any time and without notice.